The action is lighting fast (or at least the rate that they switch camera angles every nano second). The scenery is great (especially from a helicopter). The plot is lame (pizza boxes to deliver contraband guns?). The script is soap opera, even more than last week's episode (self-explanatory). As much as I never fully understood why the original Hawaii Five-O squad members wore business suits, I'm even more perplexed why the new Hawaii Five-O has to plaster the names of places on the island on the top of the tv screen where a particular scene is shot. Ala Wai canal. Waimanalo Gulch Sanitary Landfill. Know something else that's different from the original Hawaii Five-O series besides Grace Park being the next centerfold on Penthouse magazine? 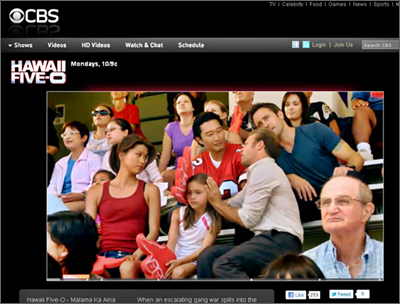 Older tv series generally use to show scenes of the next week's episode at the end of this week's episode. My eyes got big when I saw "Grace Park" and "Penthouse centerfold". I need to watch this show. Gonna look around to see where I can see the first 3 episodes I missed so far. I never watched the original, but I like action, and I like Grace Park. I watched the first episode. Too much action for me, so I won't watch anymore episodes. I guess I wasn't all that crazy about last night's episode, but I still like it. The thing that gets to me is how they never wear seatbelts. Haven't they heard about the "Click It or Ticket" campaign in Hawaii? They're also talkig on the cellphone while driving. All these are big no no's in Hawaii. Brad- I watched it from here. Seems that they allow you to rerun episodes of any tv series over the Internet .... with commercials. gigi- yeah, lots of violence. And the way they shoot the scenes, the camera is always shaking or jittery to permeate a sense of urgency. Kay- law enforcement officers, taxi drivers, etc. are exempt from the cell phone ban while driving. Still suppose to be exclusively for official business though.